Hypoplastic left heart syndrome (HLHS) is a rare congenital heart defect in which the left ventricle of the heart is severely underdeveloped. In babies with HLHS, the aorta and left ventricle are underdeveloped before birth, and the aortic and mitral valves are either too small to allow sufficient blood flow or are atretic (closed) altogether. As blood returns from the lungs to the left atrium, it must pass through an atrial septal defect to the right side of the heart. To see how a heart with HLHS varies from a healthy heart, see the graphics on the Cove Point site. In cases of HLHS, the right side of the heart often must pump blood to the body through a patent ductus arteriosus. As the ductus arteriosus usually closes within eleven days after birth, blood flow is severely restricted and eventually cut off, leading to dangerously low circulation and eventually to shock. The majority of congenital heart defects have no known cause. If part of the endocardial tube gets pinched shut in a region that becomes the future ventricle, hypoplastic heart syndrome will occur. If the pinched part of the endocardial tube is the bulbus-cordis region of the developing heart, hypoplastic RIGHT syndrome will occur. If it is in the ventricle region it will be the LEFT side that is hypoplastic. There is evidence associating it with Gap junction protein, alpha 1. Colleagues at Cincinnati Children’s Hospital in Ohio studied 1,500 newborns from 38 children’s hospitals in the United States from the 1990s to 2006. They found that babies born between April and July were more likely to have this defect, establishing strong evidence that seasonality and  environmental factors play a significant role in causation. Without life-prolonging interventions, HLHS is fatal, but with intervention, an infant may survive. A cardiothoracic surgeon may perform a series of operations or a full heart transplant. Before surgery, the ductus must be kept open to allow blood-flow using medication containing prostaglandin. Air with less oxygen than normal is used for infants with hypoplastic left heart syndrome. These low oxygen levels increases the pulmonary vascular resistance (PVR) and thus improve blood flow to the rest of the body, due to the greater pressure difference between the lungs and body. Achieving oxygen levels below atmosphere requires the use of inhaled nitrogen. Nitric oxide is a potent pulmonary vasodilator, thus reduces PVR, improves venous return. Any factor that increases PVR will impede right sided flow. Surgical operations to assist with hypo-plastic left heart are complex and need to be individualized for each patient. A cardiologist must assess all medical and surgical options on a case-by-case basis. Currently, infants undergo either the staged reconstructive surgery (Norwood or Sano procedure within a few days of birth, Glenn or Hemi-Fontan procedure at 3 to 6 months of age, and the Fontan procedure at 1 1/2 to 5 years of age) or cardiac transplantation. Current expectations are that 70% of those with HLHS will reach adulthood. Many studies show that the higher the volume (number of surgeries performed) at a hospital, the lower the mortality (death) rate. Therefore, the main determinant of success is the choice of hospital. Other factors that increase an infant's risk include lower birth weight, additional congenital anomalies, a genetic syndrome or those with a highly restrictive atrial septum.) For patients without these additional risk factors, 5 year survival now approaches 80%. Further, studies show that about 50% of those children who survived surgery in the early development of staged reconstruction have developmental delay or need special education; about 25% of these surgical survivors have severe disabilities. There is growing evidence that while the incidence of developmental and behavioral disabilities continues to be higher than that in the general population, children operated upon in the more current era have shown significantly better neurological outcomes. An alternative to the traditional Norwood is the Hybrid procedure. Some physicians offer "compassionate care", instead of the surgeries, which results in the child's death, usually within 2 weeks of birth. Compassionate care is overseen by a physician, and may be carried out either in the hospital or at home. However, due to the vast improvement of surgical intervention, with many hospitals achieving over 90% survival, there is debate on whether or not "compassionate care" should still be offered to families. A study in 2003 concluded that a selection of physicians who are experts in the care of children with HLHS were evenly split when asked what they would do if their own children were born with HLHS, with 1/3 stating that they would choose surgery, 1/3 stating that they would choose palliative (compassionate) treatment without surgery, and 1/3 stating that they are uncertain which choice they would make. During this time the baby may be medically fragile and have feeding problems because the heart is working very hard. There is a considerable degree of venous mixing in the right ventricle, leading to lower oxygenation saturation. In addition, the Blalock-Taussig shunt and the Sano shunt both expose the lungs to systemic arterial pressures, leading in the long term to pulmonary hypertension and eventually to heart failure. The Norwood Procedure is generally performed within a week of birth, the second stage at 3–6 months of age, and the Fontan at 18 months to four years of age. 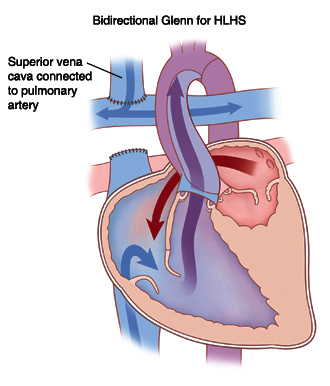 There are two types of Fontan: the Lateral Tunnel Fontan, and the Extracardiac Fontan. When the Fontan Procedure was first being done for children with HLHS, the only Fontan was the Lateral Tunnel Fontan. This requires actual cutting in the heart itself to create a "tunnel" by which the blood can travel passively to the lungs. Within the last decade, doctors have created an Extracardiac Fontan. This operation creates a tunnel outside the heart itself which reduces the chances of Fontan patients developing scar tissue on the heart which might later cause arrhythmias. While infants successfully treated for HLHS have a good chance of survival, they may experience chronic health problems for the rest of their lives. The 3-stage surgeries were developed in the early 1980s with no survivors prior to that time. Therefore, the earliest survivors are in their early 30s and the long term prognosis is unknown. However, the advances in surgical and medical techniques have helped increase the survival rate dramatically since the surgeries were first developed. As is true for patients with other types of heart defects involving malformed valves, HLHS patients run a high risk of endocarditis, and must be monitored by a cardiologist for the rest of their lives to check on their heart function. The three stage Norwood procedure only increases the life span of the heart as HLHS cannot be cured. A heart transplant may be needed at some point in the child's lifetime. There is an extensive network of parents and children who have experienced this problem, and a number of targeted small press publications and websites. Patients receiving the Fontan Procedure have an increased incidence of "Plastic Bronchitis." The National Birth Defects Prevention Network estimates that birth defects occur in about three percent of live births in the United States. Of those birth defects, HLHS occurs in one out of 4,344 live births, or an estimated total of 960 live births every year in the United States. HLHS occurs at a sixth of the rate of the most common birth defect, Trisomy 21 (Down syndrome). ^ "Hypoplastic Left Heart Syndrome Causes". Mayo Clinic. Archived from the original on 2008-04-04. Retrieved 2008-01-09. ^ "Hypoplastic left heart syndrome is caused by genetic factors". Retrieved 2008-01-09. ^ Dasgupta C, Martinez AM, Zuppan CW, Shah MM, Bailey LL, Fletcher WH (2001). "Identification of connexin43 (alpha1) gap junction gene mutations in patients with hypoplastic left heart syndrome by denaturing gradient gel electrophoresis (DGGE)". Mutat. Res. 479 (1–2): 173–86. PMID 11470490. doi:10.1016/S0027-5107(01)00160-9. ^ Eghtesady P, Brar A, Hall M (February 2011). "Seasonality of hypoplastic left heart syndrome in the United States: a 10-year time-series analysis". J. Thorac. Cardiovasc. Surg. 141 (2): 432–8. PMID 20817208. doi:10.1016/j.jtcvs.2010.06.060. ^ Green A, Pye S, Yetman AT (August 2002). "The physiologic basis for and nursing considerations in the use of subatmospheric concentrations of oxygen in HLHS". Advances in Neonatal Care : Official Journal of the National Association of Neonatal Nurses 2 (4): 177–86. PMID 12881932. doi:10.1053/adnc.2002.33542. ^ Khambadkone, S., Li, J., De Leval, M. R., Cullen, S., Deanfield, J. E., & Redington, A. N. (2003). Basal pulmonary vascular resistance and nitric oxide responsiveness late after Fontan-type operation. Circulation, 107(25), 3204-3208. ^ Norwood, W. I. (1991). Hypoplastic left heart syndrome. The Annals of thoracic surgery, 52(3), 688-695. ^ McHugh, KE; Hillman, DG; Gurka, MJ; Gutgesell, HP (Jan–Feb 2010). "Three-stage palliation of hypoplastic left heart syndrome in the University HealthSystem Consortium". Congenital heart disease 5 (1): 8–15. PMID 20136852. doi:10.1111/j.1747-0803.2009.00367.x. ^ Hirsch, JC; Gurney, JG; Donohue, JE; Gebremariam, A; Bove, EL; Ohye, RG (July 2008). "Hospital mortality for Norwood and arterial switch operations as a function of institutional volume". Pediatric cardiology 29 (4): 713–7. PMID 18080151. doi:10.1007/s00246-007-9171-2. ^ Wernovsky, Gil (1 September 2008). "The Paradigm Shift Toward Surgical Intervention for Neonates With Hypoplastic Left Heart Syndrome". Archives of Pediatrics & Adolescent Medicine 162 (9): 849–54. PMID 18762602. doi:10.1001/archpedi.162.9.849. ^ Kon, Alexander A.; Ackerson, Lynn; Lo, Bernard (31 May 2003). "Choices physicians would make if they were the parents of a child with hypoplastic left heart syndrome". The American Journal of Cardiology 91 (12): 1506–1509. PMID 12804748. doi:10.1016/S0002-9149(03)00412-0. ^ "Endocarditis: Risk factors". MayoClinic.com. Retrieved 2007-10-23. ^ Parker SE, Mai CT, Canfield MA, Rickard R, Wang Y, Meyer RE, Anderson P, Mason CA, Collins JS, Kirby RS, Correa A; National Birth Defects Prevention Network. (2010). "Updated National Birth Prevalence estimates for selected birth defects in the United States, 2004-2006.". Birth Defects Res A Clin Mol Teratol. 88 (12): 1008–16. PMID 20878909. doi:10.1002/bdra.20735. 40x40px Wikimedia Commons has media related to Hypoplastic left heart syndrome. Hypoplastic left heart syndrome information for parents. 120+ stories of children born with Hypoplastic Left Heart Syndrome hosted by the The Congenital Heart Information Network. HLHS email support groups/discussion list hosted by the The Congenital Heart Information Network (membership required). Designer Heart, A Congenital Heart Defect Network. It's My Heart, a non-profit organization created to provide support to and advocating for those affected by Acquired and Congenital Heart Defects.